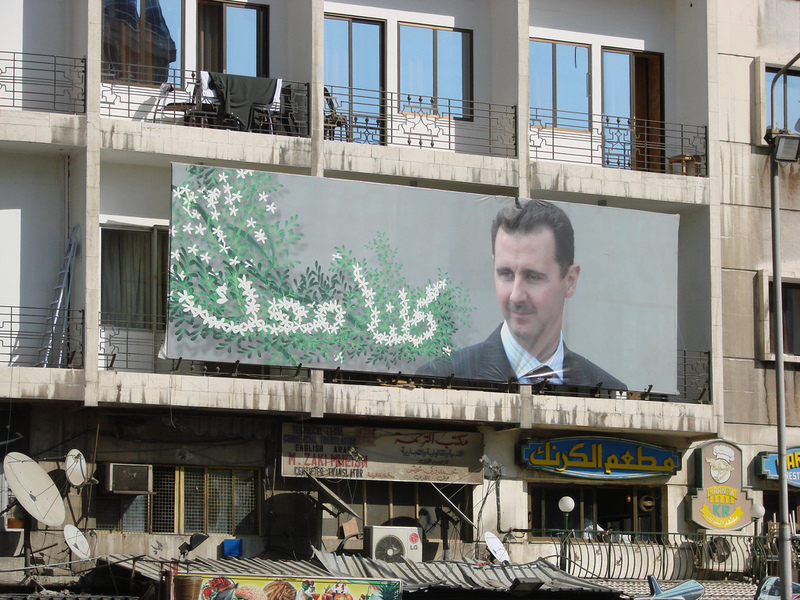 A typical propaganda poster featuring Syrian President Bashar al-Assad. (watchsmart/Creative Commons, https://creativecommons.org/licenses/by/2.0/). WASHINGTON — Middle East experts say the recent wave of terrorist attacks in France, Lebanon and Egypt eventually will serve to doom the Islamic State group, but they are calling for renewed action in the Syrian civil war aimed at bringing down the Assad government. In comments Monday, Brookings Institution fellows proposed building a more robust Syrian rebel army to combat the forces of President Bashar al-Assad, who, the panelists said, is the root of the problem. President Obama has focused on dismantling the Islamic State group, also known as ISIS and ISIL, through airstrikes. And progress has been made in the struggle against the terrorists, the think tank experts said at a panel discussion in Washington, D.C. Since the attacks in Paris that killed more than 120 people Friday, France has escalated airstrikes in Syria against the Islamic State group. William McCants, Brookings’ director of U.S. relations with the Islamic world, said the recent attacks in Paris, Beirut and, likely, in the skies above the Sinai in Egypt show a significant shift in the Islamic State group’s approach. McCants said the suspected ISIS attack against the Russian airliner in Egypt and its two suicide bombs against Hezbollah in Beirut on Thursday may be a reaction to the terrorist group losing 25 percent of its territory in the region. This change of approach for ISIS — which now seems determined to push outward and attack its enemies in other countries, rather than drawing them into the Middle East — could spell the group’s end, McCants said. The panelists said the rise of ISIS can be attributed to two factors: The departure of most U.S. ground forces from Iraq and Afghanistan, and the outbreak of the Syrian civil war that to date has cost 300,000 lives. No one proposal to address ISIS will be easy to carry out, the Brookings panel members acknowledged. But they also criticized the Obama administration’s approach thus far as hampered by “half measures,” including dwelling too specifically on the Islamic State group.